The 2012 release of The Ragbirds fourth studio effort Travelin’ Machine is a new milestone for the band. It’s the soundtrack of the observant road-warrior, with layers of world grooves that stir the listener to move. The songs strike a balance between home and adventure, drawing upon elements of Pop, Gypsy, Afro-Cuban, Celtic, Middle Eastern and African sounds, with a little Cajun spice. The energy of multi-instrumentalist Erin Zindle demands attention. 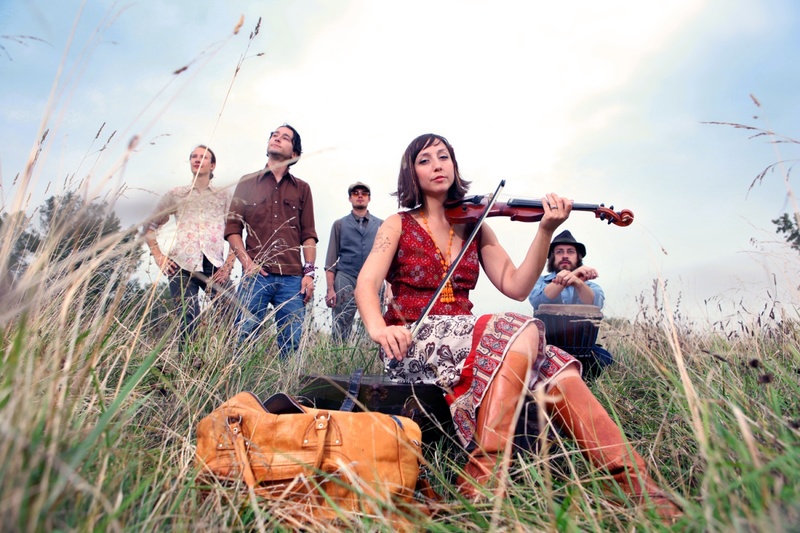 She is the songwriter and front woman of the band, skillfully switching between violin, mandolin, accordion, banjo and percussion, all while dancing. Zindle wears an infectious smile and a positive message, always spun through a poetic loom. 2007′s travel-themed “Wanderlove” was Homegrown Music Network’s #1 selling album in the fall of 2008. Erin’s brother, guitarist T.J. Zindle, joined the band in 2008 and brought a grittier rock-n-roll edge to The Ragbirds’ sound while multiplying the band’s stage energy. The 2009 international release of “Finally Almost Ready” saw the band invade Japan with the single “Book of Matches” reaching #1 on the charts in Osaka. In 2010 the current lineup came together with bassist Brian Crist and drummer Loren Kranz ,and The Ragbirds reached yet another milestone in their young careers when they independently marketed and sold their 10,000th album. The Ragbirds albums have received local and national praise, hailed “Highly impressive!” by USA Today and touted as “Astounding international eclecticism” by Reveal Arts. In just six years the band has performed in over forty states to a tune of 150+ shows a year. Crisscrossing the nation in their converted diesel bus that runs on recycled waste vegetable oil, promoting environmental sustainability, The Ragbirds have become festival favorites. They have won over crowds at Rothbury, 10,000 Lakes, CMJ Music Marathon, Summer Camp, Electric Forest, Wheatland, Blissfest, Wookiefoot’s Harvest Fest, Ann Arbor Folk Festival, Hookahville, and many more, and have shared stages with Rusted Root, Matisyahu, Railroad Earth, John Butler Trio, Toubab Krewe, Cornmeal, Greensky Bluegrass, Hot Buttered Rum, Jeff Daniels, The Everyone Orchestra, The Duhks, and many others.